More than 100 Special Olympics athletes will take to the slopes at Perfect North Slopes in Lawrenceburg, Ind., when the Special Olympics Kentucky State Winter Games return to that venue Jan. 27-29. Athletes will compete in alpine skiing and snowshoeing over the three days. Activities get underway on Sunday, Jan. 27, with an optional practice for skiers in the afternoon. On Sunday evening the Opening Ceremonies will officially kick off the Games with the parade of athletes and the skiing of the Flame of Hope down the Perfect North Slopes hillside to the Special Olympics cauldron. Monday is a day of practice followed by time trials. In the morning, skiers will be paired with volunteer ski partners to get reacclimated to being on the snow and to improve their skills. Snowshoers will have access to their course to once again get used to running on the snow. That afternoon, athletes will participate in time trials on their courses to set up divisioning for Tuesday’s races. Monday night, athletes will take part in the annual victory dinner and dance in the East Lodge at Perfect North. Tuesday is race day! Athletes will arrive on Tuesday morning and head straight to their courses for competition. After lunch, awards will be presented in a single awards ceremony in the East Lodge. 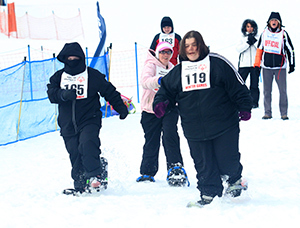 The State Winter Games is one of the most unique events on the Special Olympics Kentucky calendar. 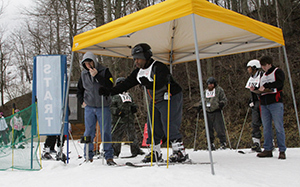 The participation of ski partners from the Cincinnati Ski Club and other volunteer groups provides one-on-one volunteer to athlete training that is impossible at most other state events. This is the 39th year for the Special Olympics Kentucky State Winter Games and it marks 22 years for Perfect North Slopes as the host of the Games. The State Winter Games were previously held at Ski Butler in Carrollton before that facility closed. The State Winter Games is sponsored by year-round partners Delta Dental, Texas Roadhouse and Toyota Motor Corporation, gold medal sponsor Speedway Children’s Charities Kentucky Chapter and supporting sponsors Perfect North Slopes, Kentucky Utilities, Independent Pilots Association, Indiana Department of Corrections, KFC and Wendy’s. For more information about the State Winter Games, including how to compete or volunteer, contact Kim Satterwhite at 502-695-8222 or ksatterwhite@soky.org.